The church I grew up in raised me to love the Bible and all its stories, but didn’t talk much about tradition, or the historic creeds, confessions, and catechisms. I learned the Bible every week, but I was missing out on what my spiritual grandparents had to offer me. It wasn’t until seminary that the significance of what came before me began to sink in. That’s when I discovered my need for what I like to call extra-biblical humility. When my sister-in-law started college, she met a group of people who knew their Bibles from back to front. They were zealous for God, called themselves a church, but something about their beliefs didn’t seem right. They told her she had to be baptized to be saved and their’s was the only baptism that counted. After all, Ephesians 4:5 says “one Lord, one faith, one baptism” so someone must have the one true baptism. Warning sirens! The group my sister-in-law ran into was a very real cult. But how did they get to a place of such poor theology? They got there, and we can too, by placing our personal interpretation of the Bible next to the Bible in importance. A healthy Christian belief system rich in extra-biblical humility is like a house. The Bible is the rock upon which we build our home. It is where we build our theology, not around it, but upon it. This differs from Roman Catholicism which puts Scripture and tradition on par. We test everything we believe today to make sure it stands upon God’s word. The creeds and confessions are the foundation from which the house that is evangelical belief, practice, and personal interpretation should rise. Various traditions will hold to their own specific confession, like the Westminster, Savoy, or London, but we should all hold to the early creeds. This is why we need to recite the Apostles’ and Nicene creeds often. Catechisms like the Heidelberg or more modern New City also function as checks for our beliefs. All of these help us stand firm within the circle of right Christian belief called orthodoxy. We now build the structure of our home with the global preaching of pastors and teachers. As a pastor in America, I have a different perspective on God’s word than pastors in Asia, but we should all preach the same good news and essential doctrines. Our explanations of the Trinity, the fall, salvation by God’s grace through faith, the inerrancy of Scripture, substitutionary atonement, and more, although contextualized, should mean the same thing. Our house rises higher with traditional interpretations of God’s word. Our home is almost built, but not without caring about the past and what it declared to be right belief. Have you just created a brand-new theology that solves everything? Be wary. If you think the Church has really gotten it wrong up to this point, then you could be right, but you could also be undercutting the role of the Holy Spirit as he sustains the ministry and belief of the Church. 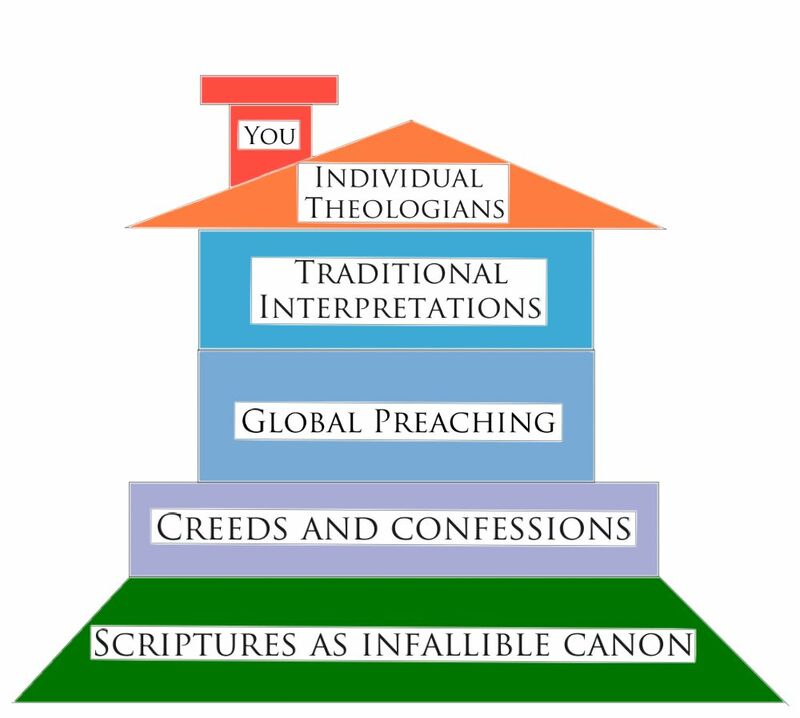 At the top we come to individual theologians. We all have pastors, elders, preachers, theologians, and popular authors we like. It’s often tempting to put their interpretations of God’s Word on par with Scripture, but we should always be careful in doing so. When our favorites preach a biblically true sermon, they too preach authoritatively, but their interpretation should not deviate from the rest of the house, especially the essential doctrines. The Word of God is sufficient for faith and practice, but God has also given us a rich heritage to guard, protect, and mature us as disciples. Let’s make sure we and our churches understand the importance of what has come before us by reciting creeds in our worship services, explaining right belief from the pulpit, and reviewing catechisms, traditions, and theologians in our Small Groups and Sunday Schools. Knowing what’s come before and having extra-biblical humility is a sign of a humble and mature disciple. It’s a sign to those you are discipling that you don’t have all the answer and ultimately points them back to Christ and to the community of faith who looked to Christ before us. When I arrived at seminary, I didn’t have much extra-biblical humility. I couldn’t have told you much about dogma, doctrine, or theology, but the more I learned about the history of the Church and all it has to offer, the more grateful I became. When I realized I didn’t have to figure out everything anew for myself, it gave me the freedom to enjoy, study, and discover the Bible in a whole new light because I knew I was safeguarded by historic orthodox belief. Jonathan M. Romig (M.Div., Gordon-Conwell, 2013) is the Pastor of Cornerstone Congregational Church, a new church in Westford, MA. Gospel-Centered Discipleship (GCD) published an earlier edition of this article.